"The Roman Empire at the apex of its glory flourished in the era of land power. The British Empire flourished in the age of sea power. Thus our United States, in the epoch of airpower, will flourish only on the basis of matchless airpower. Every American – man, woman and child – must be an airman in his heart." -Born in Tifflis, Russia in 1894, grew up near St. Petersburg. His father was a wealthy poet and actor with an interest in mechanical things. -Attended the Imperial Naval Academy of Russia, graduating in 1914. -Became a Russian Naval Aviator during World War I, lost a leg in combat, went on to destroying 13 German aircraft (while flying with an artificial leg). He was the leading Russian Naval Ace of World War I and he won Russia’s highest military honors. -Appointed to a Russian Aviation Commission and was sent to the U. S. in 1918. Due to the Russian Revolution which occurred while he was here, he decided to stay. During this transitional period he briefly operated a restaurant in Manhattan. -Worked for the U. S. Air Service as a consultant 1919 – 1922 and for them developed a new, more accurate bombsight. -Using money from the sale of his bombsight to the U. S. Government ($50,000) he founded the Seversky Aero Corporation in 1922. -As head of this small company in the 1920’s, he developed several new devices for aircraft, none of which proved profitable. -Described as energetic, focused, imaginative and warm-hearted. Also liked to dance, ice skate, swim, play the piano and had a good sense of humor. Considered flamboyant and a real showman, which ultimately hindered his relationship with Air Corps. -Lived in Garden City and Asharoken from the 1920’s to 1970’s. -Organized a new company, the Seversky Aircraft Corporation in Farmingdale in 1931, with Wall Street backing, and with himself as President and Chief Test Pilot. This new company was to specialize in long-range high-speed pursuit planes. 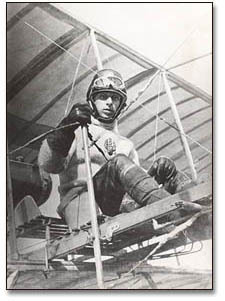 -Their first aircraft was an amphibian in which he set several speed records. -More advanced versions of the amphibian were ultimately sold to the Army Air Corps as Trainers (BT-8) and Fighters (P-35) in the mid 1930s, he was also instrumental in the development of the forerunner of the famous P-47 Thunderbolt Fighter of World War II. -Known as a far better showman than a businessman, his company never turned a profit. -Despite Government purchases the company continually operated in the red, and the Board of Directors voted DeSeversky out as President in 1939 and re-organized the company as the Republic Aircraft Corporation. -Freed from corporate commitments, he turned to writing. His passion was airpower and his mission over 30 years was to convince the American people that it had revolutionized warfare. In this capacity he had far more influence as a writer than he ever had as a plane maker. -Awarded the Harmon Trophy as the Outstanding Aviator for 1939 and 1947. -In the 1940s, 50s and 60s he wrote and lectured extensively on military theory and airpower, always promoting strategic bombardment and a strong Air Force. 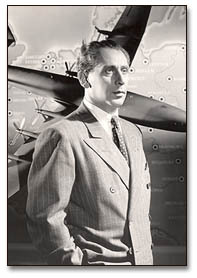 He was considered a leading expert on the tactics and strategy of aerial warfare and he considered global airpower as the solution to America’s security needs. -Recipient of many awards and honors for his continuous promotion of airpower. -Died in 1974 at age 80.